Richard van Oostenbrugge is one of the most decorated Dutch chefs of his generation, with accolades including French restaurant guide Gault & Millau’s Chef of the Year 2014 for the Netherlands. Formerly of two Michelin-starred Bord’Eau Restaurant Gastronomique in Amsterdam, he is known for his distinct brand of modern European fare flecked with influences and ingredients from around the world. This has propelled his own Restaurant 212, which opened earlier this year, to the forefront of his native country’s growing food scene. He aims to do the same in Singapore with Table65. Table65 is chef van Oostenbrugge’s first foray into Asia and with the restaurant at Resorts World Sentosa, he aims to do away with the stereotypical formalities of fine dining, focusing instead on high-quality, modern European fare served in a more laidback and homely setting. The choice of Singapore as his first overseas outpost was influenced by the nation’s strong food culture, and van Oostenbrugge says he is “confident the restaurant will add more colour to the vibrant dining scene”. Browse Table65’s extensive menu and you will find most of van Oostenbrugge’s signature contemporary dishes from Restaurant 212, but featuring produce and ingredients sourced from Asia. A definite standout—and an ideal example of his global mindset—is the meaty piece of foie gras, which he painstakingly marinates overnight in kombu stock, before baking it and topping it with umeboshi or plum jam for an additional touch of fruitiness. The dish is then served with a light kombu dashi broth. Naturally, van Oostenbrugge ’s signature Green Apple, one of the most Instagrammed desserts in Amsterdam, is part of the sweet offerings. 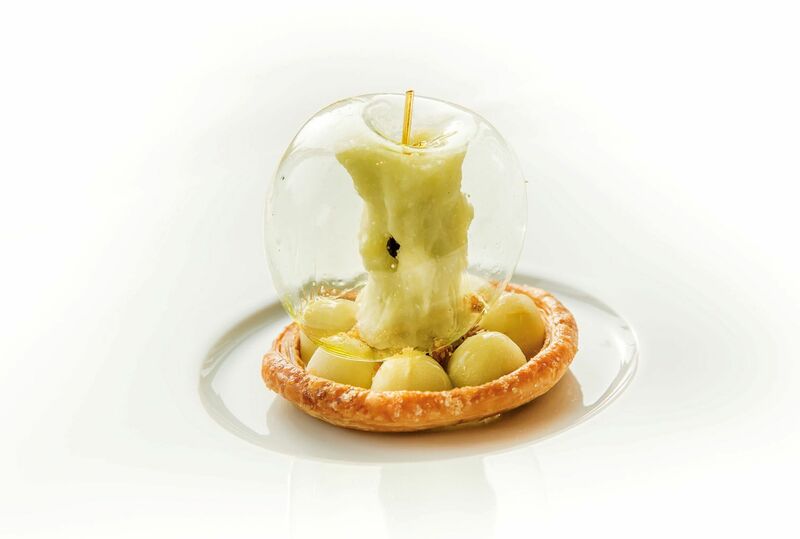 The Singapore rendition features a stunning and transparent sugar bubble that encases the green apple sorbet shaped like the core of the fruit. Salted caramel and walnut replace the chocolate “pips” in the base of crisp puff pastry, on which the apple sits. Table65 stays true to Restaurant 212’s “fine-casual” DNA, right down to its subdued yet elegant interior, swathed in hues of greys, dark browns and greens. It is also stripped of the white tablecloths and numerous cutlery you would normally find on the table at fine dining establishments. Instead, what you get is a communal setting with 31 seats around the open kitchen, which serves as the stage for the talented culinary team. Take a seat and be regaled with the chefs’ culinary prowess as well as the colourful stories behind their intricate creations.